in the Bahgallah Memorial Hall, near Casterton in south-west Victoria, Australia. with the names on the Honour Roll below. to any of the information below. E. BAUGH Edgar Arthur "Paddy" BAUGH, b. 1895, Killara, near Casterton, Victoria, son of John Andrew BAUGH and Elizabeth GALPIN and known as "Paddy" BAUGH. He enrolled at Bahgallah School in 1901 with his father John recorded as a labourer of Killara, near Bahgallah. He enlisted in the AIF on 20 Mar 1916 at Casterton and embarked from Melbourne on 27 May 1916. He arrived in France on 23 Nov 1916 and served as Pte 1239, 39th Battalion, AIF. He was gassed on 7 Jun 1917 from which he recovered, but was KIA at Ypres, Belgium on 4 Oct 1917. Unknown grave. G. BEDDLE	 Appears to be George Alfred BEDDELL, b. 1888, Sandford, Victoria, son of Richard Henry BEDDELL 1856-1938 and Catherine WILSON 1863-1891. George enlisted 22 May 1916 at Hamilton, Victoria as Pte 6619, 7th Battalion, AIF, and embarked from Melbourne on 2 Oct 1916 with the 21st Reinforcements for the 7th Battalion, AIF. He arrived in France on 20 Apr 1917 and was KIA on 4 Oct 1917, Broodseinde Ridge, Belgium. Unknown grave. J. CARTER Appears to be John Robert CARTER, b. 1880, Casterton, Victoria, son of Matthew CARTER and Christina Hamilton GILCHRIST. John CARTER was a student at Bahgallah School in 1890 with his father recorded as matthew CARTER, Blacksmith of Bahgallah. John was a Blacksmith when he enlisted in the AIF on 7 Apr 1915, Adelaide, SA, and served with the 4th Light Horse Field Ambulance & 15th Field Ambulance, AIF in the Middle East. He RTA 4 Feb 1919 and died at Skipton, Victoria in 1952. A. CRAIG Appears to be Alfred CRAIG, b. 1874 Port Fairy, Victoria, son of Robert CRAIG and Margaret Graham THOMAS. Alfred enrolled at Bahgallah as a student (age 3y) in 1877 and again (age 11y) in 1886 with his father Robert CRAIG listed as Teacher, Bahgallah. A. E. CRAIG Appears to be Adrian Ernest CRAIG, b. 1878 Port Fairy, Victoria, son of Robert CRAIG and Margaret Graham THOMAS. Adrian enrolled at Bahgallah as a student in 1882 with his father Robert CRAIG listed as Teacher, Bahgallah. Adrian enlisted in the AIF on 16 Jul 1917 in Perth, Western Australia and served as Air Mechanic 2328 with the Australian Flying Corps in England from 1917-1919 and he RTA to Perth on 17 Oct 1919. He married in Perth in 1907 and had at least 4 children in WA. R. CRAIG Appears to be Robert Walter David CRAIG, b. 1880 Bahgallah, Victoria, son of Robert CRAIG and Margaret Graham THOMAS. Robert enrolled at Bahgallah as a student in 1884 with his father Robert CRAIG listed as Teacher, Bahgallah. He married Pearl / Beril Josephine FOLEY in 1905 and they had 4 known children. H. FUTTRELL Appears to be Homer Joseph FUTERIEAL, b. 1885, Mount Gambier, South Australia, son of John FUTERIEAL & Mary GALPIN. Homer enrolled at Bahgallah School in 1890 with his father John being a Labourer of Bahgallah. He was a labourer of Dunrobin, near Casterton when he enlisted in the AIF in 1916. Served in WW1 as Pte 2677, 60th Battalions, AIF, enlisted 3 Apr 1916, RTA 20 May 1918. Homer served in France and was wounded in France in 1917. Homer was married after 1920 to Mary Agnes KERR and they are both buried in the Coleraine Cemetery. R. FUTTRELL Appears to be Reuben Arthur FUTERIEAL, b. 1882, Mount Gambier, South Australia, son of John FUTERIEAL & Mary GALPIN. Reuben enrolled at Bahgallah School in 1890 with his father John being a Labourer of Bahgallah. He was a labourer of Casterton when he enlisted in the AIF in 1915. Served in WW1 as Pte 2792, 7th & 59th Battalions, AIF, enlisted 5 Jul 1915, RTA 4 May 1917. Reuben served at Gallipoli with the 7th Battalion and was severely wounded in France with the 59th Battalion, repatriated home and discharged medically unfit on a military pension in 1917. Reuben's brother Homer FUTERIEAL 1885-1929, was also wounded in France with the 60th Battalion, AIF. Reuben was married after 1920 to Lucy Maud DOWLING and they are both buried in the Casterton Cemetery. H. GLEED Henry George GLEED, b. 1889, Casterton, Victoria, son of Richard James GLEED and Eleanor Jane GILDING. He enrolled at Bahgallah School in 1894 with his father being a Farmer of Bahgallah. He was a Farmer of Casterton when he enlisted in the AIF on 12 Apr 1916 and served with the 21st Battalion, AIF in France. He was WIA 30 Mar 1917 and RTA in 1918. He died in 1966. J. GRAHAM Appears to be James Joseph GRAHAM, b. 1878, Casterton, Victoria, son of George GRAHAM and Mary Ann MORESSY. He enrolled at Bahgallah School in 1882. He enlisted in the AIF in 1916 but was discharged as medically unfit. He enlisted again 23 Apr 1917 as a Cook of Ballarat and embaked with 8th Light Horse Reinforcements 7 Sep 1917. He served in the Middle East with this unit and RTA per "Aeneas" on 5 Feb 1919. He died in Melbourne in 1951. H. GRIGG John Handel GRIGG, b. 1893, Yackandandah, Victoria, son of Albert Edward GRIGG ~1861-1940 and Laura Alberta GUEST ~1867-1946. Albert Edward GRIGG was a Teacher at Bahgallah S.S. 1900-1903 with 4 of his children enrolled as students. One of those children was John Handel GRIGG who enrolled in August 1900. Pte John Handel GRIGG embarked with the New Zealand Expeditionary Force in 1917 bound for London and WW1. His father's address at that time was recorded as Gordon, New Zealand. C. GRINHAM Clement Oliver GRINHAM, b. 1896, Casterton, Victoria, son of Gerad GRINHAM and Agnes Jane MURPHY of Sandford Road, Casterton. He enrolled at Baghallah School in May 1908 and was aged 19y 4m when he enlisted in the AIF on 27 Sep 1915 after serving for 2 years in the Casterton Light Horse. He embarked from Melbourne on 14 May 1916 with the 4th reinforcements for the 29th Battalion, AIF. He joined the 29th Battalion in France on 25 Nov 1916 and served as Pte 2418, 29th Battalion, AIF, and was KIA in France on 7 Dec 1916 and buried in the Guards' Cemetery Lesboeufs, France. H. HADDEN Harold HADDEN, b. 1896, Harrow, Victoria, son of William HADDEN & Ellen Louisa GUTHRIDGE. Harold enrolled at Bahgallah School in 1910, aged 13y, with his father being listed as a farmer of Charam, near Edenhope. Harold enlisted on 19 Mar 1916 in the AIF and served with the 58th Battalion in France where he was wounded. He RTA on 1 Aug 1918 and later married Arley Evelyn Ann CARTER and they raised a family at Konongwootong North, near Coleraine. Harold & Arley are both buried in the Coleraine Cemetery in 1980 and 1994 respectively. G. HURLEY George Clarence HURLEY, b. 1890, Werona, near Talbot, Victoria, son of George HURLEY and Annie Abernathy SIEVWRIGHT. He was a teacher at Wilkin & Starthdownie which operated as a part of the Bahgallah School. "George Clarence Hurley was the son of Mr. and Mrs. G. Hurley, of Werona. He was born at Werona on the 11 th of June, 1890, and received his early education there. In 1911, he was appointed temporary head teacher at Scott's Creek, near Geelong, and, in 1912-13, held a similar position at Tandarook, near Cobden. He had temporary charge of part time schools at Strathdownie and Wilkin in 1914, part of the school at Bahgallah, near Casterton, and of the school at Toombullup East, his first permanent post. The year 1915 he spent at the Teachers' College, where, by dint of diligent application, he gained the Trained Primary Teacher's Certificate. In 1916, he taught for a little time at Mt. Bruno, near Glenrowan, and, on the 7th of March, enlisted. His record is that of a quiet, persevering teacher, gentlemanly demeanor, exercising a fine influence, and doing work of a creditable character. After enlisting, he was trained as a gunner at the Maribyrnong Camp. He sailed on the 3rd of October, 1916, and, on the 3rd of November, 1917, died at the 2nd Canadian Casualty Clearing Station from the effects of shell gas. The Creswick Advertiser says of him :-" He was a lad much loved and admired by all those that knew him. He leaves behind a memory good, clean, and noble, of which those who sorrow for his loss may even in their sadness be justly proud." Mr. James J. Hurley, head teacher at Diapur, is an only brother. He volunteered, too, but was rejected." J. JESSUP James Alexander JESSUP 1880-1924, b. 1880, Bahgallah, S-W Victoria, son of James Alexander JESSUP and Emma Elizabeth BRIGGS and attended Bahgallah School in the 188os. James enlisted in the 4th Light Horse Regiment, AIF on 2 Jan 1916 and served in the Middle East with the 1st Field Squadron Engineers, AIF where he was promoted to Cpl then Sgt, wounded in the head in 1917, awarded Mentioned in Despatches (M.I.D.) for conspicuous service, RTA 26 Jul 1919 after which he returned to New Zealand wher he married in 1923 and died in 1924 at Whatatutu, Gisborne, New Zealand. W. JESSUP Appears to be Walter JESSUP, b. 1878, Bahgallah, Victoria, son of James Alexander JESSUP and Emma Elizabeth BRIGGS. He attended Bahgallah School in the 1880s. J. JEWELL James Alexander Wells JEWELL, b. 1877, Millicent, South Australia, son of Benjamin Thomas JEWELL and Elvina JESSUP who enrolled at Bahgallah School in 1883 with his father recorded as a labourer of Bahgallah. He enlisted with the New Zealand forces served as Pte 23558, 1st Battalion, Otago Regiment, NZEF and was KIA on 27-09-1916, France. His name is recorded on the Caterpillar Valley (N.Z.) Memorial, Longueval, France as having no known grave. J. KELLY John Ernest KELLY, b. 1891, Casterton, Victoria, son of Michael Patrick KELLY and Julia Elizabeth McEVOY, farmer of Bahgallah, Victoria ; grandson of James KELLY and Mary MANGAN. He enrolled at Bahgallah School in 1896, son of Michael KELLY, farmer of Bahgallah. Enlisted in the AIF at Hamilton, Vic. 19 Apr 1916, embarked "Orantes" 16th Aug 1916, appointed L/Cpl 10th Aug 1917 and killed at Broodseinde Ridge, Belgium on 4th Oct 1917 as L/Cpl 1854, 39th Battalion, AIF, no known grave. W. KELLY William Edward KELLY, b. 1871, Casterton, Victoria, son of James KELLY and Mary MANGAN, farmers of Bahgallah. He enrolled at the Bahgallah School in 1875, son of James KELLY, Farmer of Bahgallah. He married Edith Mary Hamilton GRIFFITH of Chetwynd in 1906 and a son James Joseph KELLY was born in Casterton in 1907. William KELLY was an electrical linesman living in Adelaide, SA when he enlisted on 17 Oct 1916 in the AIF. He served as Sapper 18729 with Engineering Details, AIF in London and England 1917-1919 and RTA in Oct 1919. He died in Adelaide in 1937. He was an uncle of John Ernest KELLY 1891-1917, recorded above. J. LEHANE Jeremiah LEHANE, b. 1876, Casterton, Victoria, son of Jeremiah LEHANE and Honora O'SULLIVAN. He enrolled at Bahgallah School in Jan 1883 (age 6y) and again in Jan 1892 (age 15y). Jeremiah was aged 38y, a farmer and single when he enlisted in the AIF as Pte 4229, on 6 Aug 1915. He embarked from Melbourne in Dec 1915 with the 13th reinforcements for the 7th Battalion, AIF and joined the Battalion in March, 1916 in Egypt. He served with the Battalion in France and was wounded in June and shipped to hospital in England. He recovered in England and rejoined the 7th Battalion in France in November 1916. Jeremiah was KIA at Flers, France on 22 Dec 1916 and has no known grave. W. LIVOCK William James LIVOCK, b. 1891, Casterton, Victoria, son of George LIVOCK and Ellen MURPHY and he attended Bahgallah School in May 1901 after a transfer from Casterton. He enlisted in the AIF on 8 Feb 1916 and served overseas with the 14th Battalion until he RTA 12 May 1919 and he appears to have died in Sydney, NSW in 1922. W. McGRATH William Augustine McGRATH, b. 1877, Casterton, Victoria, son of James McGRATH and Johanna MULCAHY. James & Johanna McGRATH farmed at Bahgallah from at least 1877 to 1892 before moving to Strathdownie. William enrolled at Bahgallah School in 1882 and he was recorded as a 38 year old Stockman in Western Australia when he enlisted in the AIF on 16 Nov 1915 at Blackboy Hill, Western Australia. He trained in Western Australia and Melbourne and embarked overseas with Field Artillery Reinforcements on 25 Oct 1916. He served as Gunner 28670, 11th Field Artillery Brigade, AIF in France from Aug 1917 to 1919, being wounded in action on two occasions, the 2nd requiring evacuation to hospital in England. He RTA and disembarked at Fremantle, Western Australia on 1 Jun 1919. He probably remained in Western Australia? G. McINTYRE George McINTYRE, b. 1887, son of Murdoch McINTYRE and Mary JELLY. He enrolled as a pupil at Bahgallah School in 1894. George enlisted on 4 Jun 1915 with the AIF and served as Pte 36, 24th Battalion, embarking from Melbourne on 10 May 1915. He served in France with the 24th Battalion AIF from 1916-1919 was awarded the MID (Mentioned in General Haig's Despatches) for conspicuous service in France and he RTA on 22 May 1919. His diary from the War has survived. J. McINTYRE James McINTYRE, b. 1884, Bahgallah, Victoria, son of Alexander McINTYRE and Sarah MURPHY who enrolled as a pupil at Bahgallah School ine June 1889 with his father Alexander recorded as a Carrier of Bahgallah. James was a butcher of Casterton when he enlisted in the AIF on 25 Jan 1915 and served as Pte 1929, 16th Battalion, AIF. He was KIA at Hill 60, ANZAC on 29 Aug 1915 and was buried in the Embarkation Pier Cemetery, Gallipoli, Turkey. M. McINTYRE Murdoch McINTYRE, b. 1892, son of Murdoch McINTYRE and Mary JELLY. He enrolled as a pupil at Bahgallah School in 1896. He enlisted in the AIF on 19 Apr 1915 at Liverpool, NSW and embarked with the 20th Battalion, AIF on 26 Jun 1915. He served on Gallipoli from 6 Aug 1915 and then in France 1916-1919 until his RTA on 10 Mar 1919. T. McINTYRE Thomas Shearwood McINTYRE, b. 1891, Horsham, Victoria, son of Donald McKay McINTYRE and Catherine Ann FINLAYSON. Thomas enrolled at Bahgallah School in 1901 with another 6 siblings being born at Casterton up until 1910. His father died in 1915 which was the year he enlisted in the AIF. He was working on the Bourke Railway line in NSW as a fettler when he applied to enlist on 26 Jul 1915. He embarked overseas from Sydney as a reinforcement for the 2nd Battalion, AIF which he joined in the Middle East. He was then transferred to the 1st Machine Gun Battalion and arrived in France on 28 Mar 1916 where he served until his RTA on 5 Jun 1919. He married in NSW in 1931 and died in Melbourne in 1960. D. MENZIES Capt. Duncan MENZIES, b. 1880 Casterton, Victoria, son of Donald MENZIES & Jane MORRISON. Duncan attended school at Mosquito Plains, SA and at Bahgallah in 1892. He graduated from Adelaide University, became a teacher and later a lawyer, Auctioneer and Mayor in the Clare Valley, South Australia. He enlisted on 9 Jun 1916 in the AIF and served in France with the 48th Battalion where he was promoted to the rank of Captain. He married and had chilren in the Clare Valley and died in Adelaide in 1944. W. MILLARD William MILLARD, b. 1887, Casterton, Victoria, son of Vincent MILLARD & Elizabeth Ann Frances BURNS. William enrolled at Bahgallah School in 1892. William served in WW1 as Pte 1871, 39th Battalion, AIF, enlisted 19 Apr 1916, RTA 14 Jan 1914. He married Margaret Jane McELROY from Penola, in 1924 and they farmed their block at Langkoop. William died in 1940 and Margaret in 1970 and both are buried in the Apsley Cemetery. J. PICKEN John Morris PICKEN, b. 1898, Casterton, Victoria, son of John Francis PICKEN and Emily Elizabeth TUFFNELL. He enrolled at Bahgallah School in 1904. John was a farm labourer when he enlisted in the AIF on 24 May 1915 and served as Pte 4591 with the 14th Battalion, AIF. He was KIA on 18 May 1918 at Amiens, France and buried in the Adelaide Cemetery Villers-Bretonneux, France. C. RYAN Cornelius RYAN 1882-1952, b. Sandford, Victoria, son of Timothy RYAN and Violet SOMERVILLE. Enrolled at Bahgallah School in 1892, father recorded as Timothy RYAN, farmer of Strathdownie East. Enlisted in the AIF on 8 Sep 1915 and served as Pte 4960 with the 12th Battalion, AIF; 12th Field Artillery Brigade & 8th Battalion, AIF in France. He was wounded in action in 1918 and RTA 5 Jul 1919. He became a soldier settler on "Hilgay" estate near Coleraine and possibly died at Perth, Western Australia in 1952. M. RYAN Michael RYAN 1898-1959, b. Bahgallah, Victoria, son of Thomas Nicholas RYAN and Mary Jane TIERNEY. He enlisted in the AIF on 5 Jan 1916 and served as Pte 5199, 14th Battalion, AIF. He embarked on the "Anchises" from Melbourme on 14 Mar 1916, served in Egypt and on the Western Front; embarked from England on the ship "Delta" on 24 Jan 1919, arrived Melbourne 10 Mar 1919 and discharged from the AIF 24 Sep 1919. Michael RYAN and his brother Thomas RYAN were farewelled for overseas service from Bahgallah on 10 March 1916. NOTE : Michael RYAN also enlisted in WW2 and served in the Middle East 1940-42. He married after WW2 to Miriam Jane ..?.. and died at Tarpeena, South Australia on 3 Jul 1959. Named : Sandford Sate School No.1654 WW1 Honour Roll. T. RYAN Thomas RYAN 1896-1917, b. Casterton, Victoria, son of Thomas Nicholas RYAN and Mary Jane TIERNEY. He enrolled at Bahgallah School in 1908 with his father recorded as a labourer of Bahgallah. He enlisted in the AIF on 5 Jan 1916 and served as Pte 5201, 14th Battalion, AIF. He embarked on the "Anchises" from Melbourme on 14 Mar 1916; wounded and DOW, France, 5 Feb 1917 and was buried in the Bernafay Wood British Cemetery, Montauban, France. Named : Sandford State School No.1654 WW1 Honour Roll. A. SPRING Adam Campbell SPRING 1895-1956, b. Casterton, Victoria, son of Angus Joseph SPRING and Johanna MORRISON. 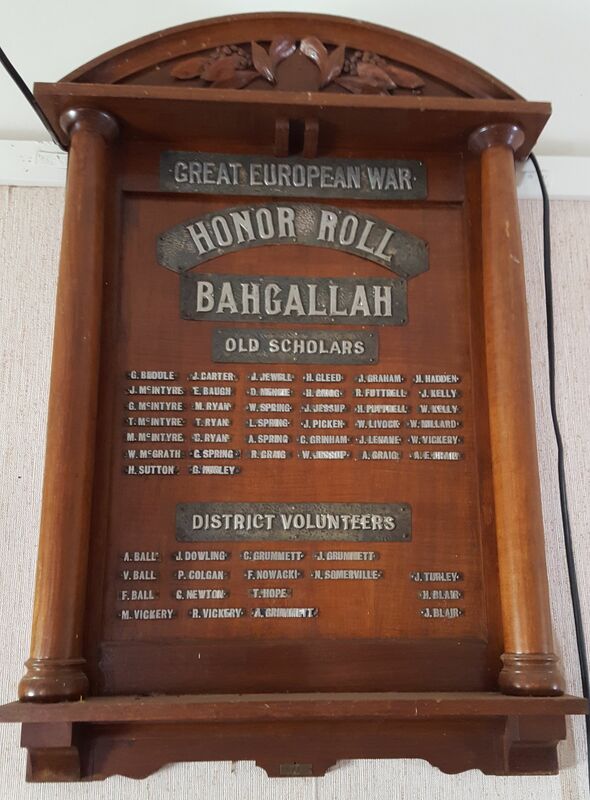 Adam enrolled as a student at Bahgallah School in 1904 and was a Grocer when he enlisted on 21 Apr 1915 in the AIF. He served as Pte 2456, 5th Battalion, AIF, embarked 16 Jul 1915 from Melbourne per "Demosthenes," served Egypt and Western Front, embarked from England per "Nestor" for RTA on 20 May 1919. He died in 1956 at Yarrawonga, Victoria. In 1921 he married Mavis Isabel Victoria SPURRELL 1897-1985, b. Casterton, Victoria to George Frederick SPURRELL and Annie McLEAN; d. Yarrawonga, Victoria. C. SPRING Michael Charles SPRING 1899-1981, b. Casterton, Victoria, son of William SPRING and Annie MORRISON. Charles enrolled as a student at Bahgallah School in 1905 and was a Labourer when he enlisted from Dartmoor on 25 May 1918 in the AIF. He served as Pte 69327, 5th Battalion, AIF. He died in Melbourne, Victoria in 1981. L. SPRING Leslie Arthur SPRING 1893-1966, b. Moama, NSW, son of William SPRING and Annie MORRISON. Leslie enrolled as a student at Bahgallah School in 1905 and was a Cabinet Maker when he enlisted on 3 Aug 1915 in the AIF. He served as Pte 1526, 4th Light Horse Regiment, AIF and the ANZAC Cyclist Battalion, AIF and RTA 15 May 1919. He died in Casterton in 1966. W. SPRING William Argyle SPRING 1895-1916, b. Moama, NSW, son of William SPRING and Annie MORRISON. William enrolled as a student at Bahgallah School in 1905 with his father recorded as a labourer of Bahgallah. He was a Blacksmith when he enlisted on 28 May 1915 in the AIF and served as Pte 2457, 5th Battalion, AIF. He was wounded and DOW, France, 26 Jul 1916 and was buried in the Warloy-Baillon Communal Cemetery Extension, France. H. SUTTON Arthur Harold SUTTON, b. 1882, Heywood, Victoria, son of Francis SUTTON (grazier of Bahgallah in the 1890s) and Julia Theresa DOYLE. He was enrolled as a pupil at Bahgallah School in 1890. He enlisted in the AIF at Portland on 23 May 1918 where he was listed as a merchant. He joined the 8th Light Horse Regiment, AIF in Egypt where he served until his RTA on 7 Aug 1919. W. VICKERY William Edward VICKERY, b. 1892, Casterton, Victoria, son of William Reuben VICKERY and Mary Jane LAMONT (McALISTER). He enrolled at Bahgallah Scool in 1906, aged 13y with his father Willian listed as a Trapper of Casterton. William enlisted in the AIF on 10 Sep 1914, served as Pte 1128, 5th Battalion, AIF, and was involved in the ANZAC landing at Gallipoli. He was wounded at Gallipoli in August and transferred to hospital in Malta and then London. He recovered and rejoined his unit in Egypt and was sent to France in 1916 where he was promoted to L/Cpl. William VICKERY was KIA at Pozieres, France on 25 Jul 1916 and is buried in the Pozieres British Cemetery Ovillers-La-Boisselle, France. A. BALL Arthur John BALL, b. 1890, Dartmoor, Victoria, son of John James BALL & Mary Jane DOWLING. Enlisted in the AIF on 25 Sep 1916 and was with the 8th Light Horse Regiment, AIF and then as Spr 3171, 3rd Field Troop, Engineers, served in the Middle East. He was kicked in the head by a horse which caused lengthy hospitalisation, he RTA 3 Sep 1919. He married Muriel Alice BURGESS of Digby and became a Soldier Settler on Glenorchy Estate, near Merino. F. BALL Frederick Henry BALL, b. 1891, Strathdownie, Victoria, son of John James BALL & Mary Jane DOWLING. He was a Blacksmith when he enlisted in the AIF on 24 Jul 1915 and embarked 6 May 1916 as with Reinforcements for the 8th Light Horse Regiment, AIF. Joined the Anzac Mounted Division the Middle East and then transferred to 3rd Field Troop Engineers. He later transferred to the 2nd Field Squadron, Engineers and became a Corporal on 20 May 1918. Frederick BALL RTA on 6 Sep 1918 where he later married Johanna SPRING of Bahgallah in 1920 and he died in Naracoorte, SA in 1956. V. BALL Victor Joseph BALL, b. 1893, Dartmoor, Victoria, son of John James BALL & Mary Jane DOWLING. Enlisted in the AIF on 6 Apr 1915 and embarked 8 May 1915. Joined the 21st at Gallipoli 29 Aug 1915, returned to the Middle East after the evacuation. Landed in France with 21st Battalion on 26 May 1916, serving with that unit and later the 24th Battalion, AIF until he RTA on 27 May 1919. He married Annie SPRING of Bahgallah and became a Soldier Settler on Glenorchy Estate, near Merino. P. COLGON Lawrence Patrick Francis COLGON, b. 1888, Mount Gambier, South Australia, son of Lawrence COLGAN and Ellen MORRESEY. Medical examination at Casterton on 26 Apr 1915 when he enlisted in the AIF. Served as Pte 2346 in the 5th & 6th Battalions, AIF in France, RTA 18 May 1919 and died at Bordertown, South Australia in 1955. J. DOWLING Edwin John DOWLING, b. 1893, Warracknabeal, Victoria, son of Frederick DOWLING and Harriet Jane SPENCER appears to have been known as John. He enlisted in the AIF from the Casterton area on 26 Mar 1915 with his Father, Frederick DOWLING, Farmer of Bahgallah named as NOK. John joined the 21st Battalion, AIF in the Middle East, RTA for medical treatment then rejoined his unit in 1916. He was transferred to the 58th Battalion and went to France on 28 Jun 1916 where he served until 1919 and RTA 24 Nov 1919. He lived at Casterton after the War, married and moved to Mildura where he died in 1967. A. GRUMMETT Alan GRUMMETT, b. 1898, Hawthorn, Melbourne, Victoria, son of Joseph GRUMMETT & Mary Fanny PAIGE. Alan enlisted in the AIF at Casterton 7 Feb 1918, his father Joseph GRUMMETT was a farmer of Bahgallah who was recorded at the time as being a Munitions Worker on Active Service in England. Alan embarked from Sydney with Artillery Reinforcements on 30 Apr 1918 and served in France in WW1 in 1918 as Gnr 39587, 6th Field Artillery Brigade, AIF, completed a Wool Classing course in England RTA 8 Sep 1919. C. GRUMMETT Clive Joseph GRUMMETT, b. 1893, Hawthorn, Melbourne, Victoria, son of Joseph GRUMMETT & Mary Fanny PAIGE. Clive was at Bahgallah, near Casterton when he enlisted in the 1st AIF, his father Joseph GRUMMETT was a farmer of Bahgallah. He served in WW1 as Pte 1987, 39th Battalion, AIF, enlisted 1 May 1916, wounded in action in France, RTA 1918. He married Alice Edith CHERRY in the 1920s and they farmed at Langkoop west of Casterton. J. GRUMMETT Joseph GRUMMETT, b. abt 1865, Lincolnshire, England, married Mary Fanny PAIGE in 1890, Victoria, Australia. Joseph & Mary had at least 4 children in Melborne from 1893 to 1905. By Sep 1913 Joseph GRUMMETT was recorded as a Farmer at Bahgallah when his youngest daughter Marjorie enrolled at Bahgallah School. Tow of his sons, Clive and Alan enlisted and served overseas in the AIF. When Alan enlisted in Feb 1918 his father was recorded as a Munitions Worker on active service in England. The National Archives has him listed as Munitions Worker No 2604 and he appears to have died at Bendigo in 1933. His other son Sydney Paige GRUMMETT 1895-1952 was a Farmer & Grazier at Bahgallah 1943-1952 when he had children attending the local Bahgallah School. T. HOPE Thomas HOPE, b. 1882 Apsley, Victoria, son of Richard Armstrong HOPE and Isabella EDGAR. Thomas was listed as a Labourer of Bahagallah Road, Casterton when he applied to the AIF in May 1916. He married Mary Anne McDONALD of Strathdownie in 1916 and they had at least 4 children after the war. He enlisted on 29 May 1916 and embarked with reinforcements for the 8th Battalion, AIF on 11 Sep 1916. He joined the Battalion in France and served there until wounded on 23 Aug 1918 when he was hospitalised in England. He RTA on 23 Mar 1919 and returned to Casterton. He became a Soldier Settler on Konongwootong North Estate where his children started school. Thomas HOPE died in 1929 and is buried in the Casterton New Cemetery. C. NEWTON Charles Henry NEWTON, b. 1894, Dergholm, near Casterton, son of Henry NEWTON and Mary "Kate" McCOMBE who worked on "Roseneath Station". He was recorded as a Labourer, aged 20y when he enlisted in the AIF on 3 Apr 1916, embarked with reinforcements for the 39th Battalion from Melbourne on 27 May 1916. He arrived in France 4 Feb 1917 and served as Pte 1700, 39th Battalion, AIF, until WIA on 7 Jun 1917 and was then invalided to England. He returned to his Battalion in France on 10 May 1918 and served until KIA on 24 Aug 1918 and was buried in the Bray Vale British Cemetery, Bray-Sur-Somme, France. F. NOWACKI Fleycian Emil NOWACKI, b. 1891, Casterton, Victoria, son of Leon NOWACKI and Isabella GRINHAM. Fleycian NOWACKI was recorded as a farmer, single, aged 23 years, of Bahgallah, when he enlisted in the AIF on 29 Mar 1915. He embarked from Melbourne on 9 Jul 1915 with reinforcements for the 24th Battalion, AIF, and arrived in the Middle East. He was transferred to the Camel Corps on 4 Mar 1916 and promoted to Corporal then Sergent on 20 Apr 1917. On 1 Jul 1918 he transferred to the 14th Light Horse Regiment and remained with that unit until his RTA on 25 Aug 1919. He married Mary Elizabeth McINTYRE, daughter of Murdoch McINTYRE and Mary JELLY, in 1921 and became a Soldier Settler on "Nangeela" Estate to the North of Casterton in 1920. He was a Glenelg Shire Councillor in the 1940s and died at Casterton in 1965 and buried in the Casterton new cemetery. N. SOMERVILLE Norman SOMERVILLE, b. 1895, "Airlie" Sandford, son of James SOMERVILLE and Catherine COTTER. Served in as WW1 Sgt 11907, 4th Field Artillery Brigade, AIF, enlisted 10 Aug 1915, Melbourne, served Egypt & Western Front, WIA 15 Oct 1917, Belgium, RTA 29 May 1919; WW2 (VDC). Later a Farmer of "Verdant Hills", Carapook. Sandford S.S.1654 WW1 Honour Roll. M. VICKERY Murdoch VICKERY, b. 1890, Casterton, Victoria, son of William Reuben VICKERY & Mary Jane LAMONT. Murdoch married Elvy Viola WILLIAMS in 1915 prior to embarkation for overseas service with the AIF. He was recorded as a labourer of Casterton when he enlisted in the AIF in 1915. Served in WW1 as Pte 3933, 21st Battalion, AIF, enlisted 16 July 1915, served in France 1916-1917, RTA 20 Jul 1917 and discharged as medically unfit and allocated a military pension. Murdoch and Elvy VICKERY had 8 chn before Elvy died in 1930 and Murdoch in 1940, both are buried in the Apsley Cemetery. R. VICKERY Reuben Lawrence VICKERY, b. 1887, Casterton, Victoria, son of William Reuben VICKERY & Mary Jane LAMONT. Reuben enlisted in the AIF on 13 Oct 1915 but was discharged soon after as medically unfit. He enlisted again on 25 Oct 1916 and embarked overseas from Melbourne in Nov 1916 with reinforcements for the 21st Battalion, AIF. He served in France from 1917 to 1919 with the 21st & 24 Battalions until his RTA on 4 Feb 1920. He moved to NSW and married in 1921 and appears to have died at Wollongong in 1971. H. BLAIR Henry Charles BLAIR, b. 1875, Casterton, Victoria, son of John Allan BLAIR, farmer of Bahgallah and Hannah LARKIN. Attended Bahgallah School S.S.1586 in the 188Os. Served in the Boer War in South Africa as Cpl 6, 4th Victorian Bushmen's Contingent. J. BLAIR William John "Jack" BLAIR 1871-1954, b. Casterton, Victoria, son of John Allan BLAIR, farmer of Bahgallah and Hannah LARKIN. Attended Bahgallah School S.S.1586 in the 188Os. Served in the Boer War in South Africa as Pte 964, 5th Victorian Mounted Rifles. "The Hamilton Spectator" (Vic.) Saturday, 30th August 1902. CASTERTON. Thursday.--A "welcome home" demonstration was given to Private John Blair, who has just returned from South Africa, on Friday evening at the Bahgallah State school ; there was a large attendance, and the returned soldier was accorded an enthusiastic welcome. He was also presented with a gold medal, suitably inscribed. A programme of songs and recitations was also given, and a very pleasant evening was passed. Jack BLAIR married in 196 to Caroline HARVEY 1870-1957, b. Digby, S-W Victoria to William James HARVEY and Ellen BURNS. Jack died in 1954 and caroline in 1957 and are buried in the Casterton new cemetery. J. TURLEY J. TURLEY, from Bahgallah, served in the Boer War. J. R. FERRIER James Russell FERRIER 1895-1974, b. Casterton, Victoria, son of George FERRIER and Annie Isabella MILLER. Enrolled at Bahgallah School 1901-1902. He enlisted in the AIF on 15 Sep 1915 and served as Cpl 1567, 3rd Light Horse Regiment in the Middle East where he was wounded in action and RTA 3 Jul 1919. He married Elizabeth Maude HERITAGE from Wentworth, NSW and died at Coleraine in 1974. NOTE : George FERRIER 1900-1995, b. Casterton, younger brother of James FERRIER was too young to attend Bahgallah school in 1902. He served with AIF 1917-1919, was with the 3rd Machine Gun Battalion, AIF in France in 1918-19. He married Jessie Ann THOMSON 1897-1977 at Hay, NSW in 1926. George and Jessie are both buried in the Coleraine cemetery. G. A. GRAHAM George Alexander GRAHAM 1880-1947, b. Casterton, Victoria, son of George GRAHAM 1858-1882 and Mary Ann MORESSY 1856-1935. He enrolled at Bahgallah School in 1886. He enlisted in the AIF on 1 May 1917 and was trained with the Machine Gun Reinforcements in Adelaide and at Seymour, Victoria. He was discharged as medically unfit on 29 Sep 1917. He enlisted again on 1 Oct 1917 but was agian discharged as medically unfit on 9 Oct 1917 in Adelaide. He married Bessie Florence TAYLOR 1899-1952, of Nelson, S-W Victoria at Mount Gambier in 1918. George and Bessie were living at Bahgallah in 1919. George died in 1947 and Bessie in 1952, both at Mount Gambier, South Australia. 7 known children. W. HUMPHRIES Walter "James" HUMPHRIES 1889-1947, b. Bahgallah, Victoria, son of Henry Robert HUMPHRIES and Mary Mary Jane JESSUP. He enrolled at Bahgallah School in 1894 and again in 1901, son of Henry HUMPHRIES, Farmer of Bahgallah. He applied to enlist in the AIF on 29 Apr 1916 as a labourer of Bahgallh. He trained as Pte 45827, 39th Battalion (3rd Reinforcements), AIF from 22 May 1916 to 29 Aug 1916 at Ballarat but was discharged as medically unfit on 29 Aug 1916. He married Ruby Muriel TAYLOR 1892-1975 of Portland, and he died at Portland in 1947. W. KIPPING William KIPPING 1883-1971, b. "Spring Bank" Station, Bahgallah, Victoria, son of John Thomas KIPPING and Elizabeth "Betsy" EVANS. Enrolled at Bahgallah School in 1895 having previously attended school at Casterton. William married Edith DAVIS 1880-1951 in 1905 and they had 6? children. He applied to enlist in the AIF on 20 Jan 1916 as a Labourer of Murray Street, Casterton. Trained with the 14th Depot Battalion and 39th Battalion (2nd Reinforcements) in Ballarat from 29 Mar 1916 to 28 Aug 1916 when he was discharged for being medically unfit. Edith died at Hamilton Victoria in 1951 aged 71y and William died at Coburg, Melbourne in 1971, aged 88y. A. F. McINTYRE Angus Finlayson McINTYRE 1883-1978, b. Casterton, Victoria, son of Donald McKay McINTYRE and Catherine Ann FINLAYSON. Angus enrolled at the Bahgallah School in May 1901 after moving from school in Casterton. He served in the RAN from 1912-1937 including service aboard HMAS "Melbourne" and HMAS "Australia" during WW1. He married Elsie Monica CHATFIELD in Victoria in 1919, and they had one son, Bernard. Angus died at the Heidelberg Repatriation Hospital, Melbourne in 1978.